Watching the vote totals and delegate counts role in on past Tuesday nights has nearly become a ritual, and this coming Tuesday is no different, and the momentum has not slowed. Super Tuesday 3 has several states with big delegate counts and the Sunshine State has the most. Florida will award 99 delegates to the GOP candidate that wins the state. Unlike almost all the states so far in the Republican race, all 99 of these are winner-take-all based on the statewide total, and that's a big deal for Marco Rubio, who hails from the state. The ongoing third-place finisher has yet to win a state — he has only come in first in Puerto Rico. Last Tuesday he didn't take home any delegates. That's worse than even John Kasich's performance. 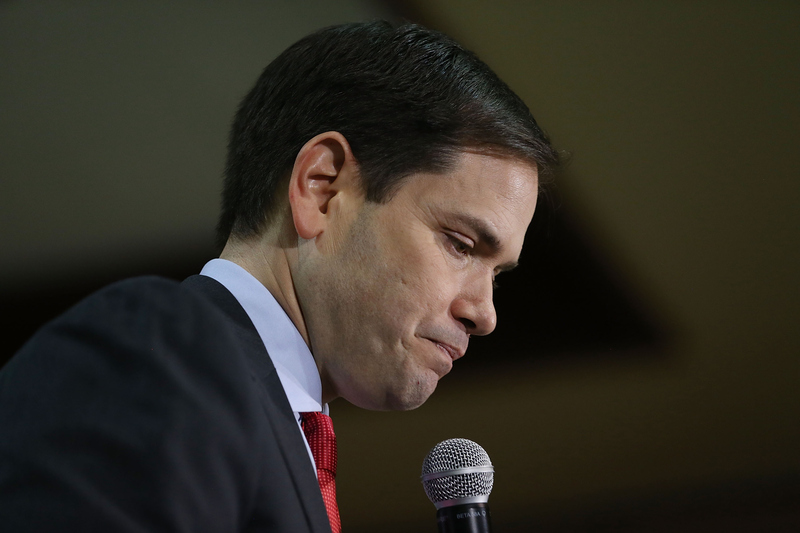 Rubio's delegate count is similarly dismal. He has 155 delegates to Donald Trump's 462 or even second-place Ted Cruz's 362. That puts him at just 42 percent of the delegates he needs to go on to win the nomination according to FiveThirtyEight. Florida could make a big difference. The 99 delegates would go all to him — if he can manage to win. Trump, though, is ahead in recent polls by about 17 percentage points. Rubio's winning Florida played a big part of the plan to keep Trump from winning the nomination outright by forcing a brokered convention. Rubio needs to win Florida and Kasich needs to win Ohio — otherwise the odds of keeping Trump under the 1,237 delegates that would guarantee him the GOP nomination are much more slim. The preference of GOP elites is a brokered or contested convention in which Trump may enter with a plurality of votes but not an outright majority. That way through maneuvering and a few round of voting they could crown a different nominee. With the polls looking so rough for Rubio, some of his advisers are pushing him to drop out of the race before Florida votes. Their thought is that a poor showing could hurt him politically also in the longterm. He would be seen as a week candidate for Florida governor, and he could also be passed up as a vice president pick. Performing strong in Florida would have made him a sought-after choice given the state's swing-state status. Meanwhile Cruz is not playing by the bigger GOP plan that would be helped by Rubio winning Florida. He's hoping that a Florida loss will cause Rubio to drop out and clear the way for him to be the only remaining threat to Trump. Whatever happens next Tuesday, you can count these 99 delegates will play a big roll in the future of the GOP race.